Well, Happy New Year, I hope you've had a fab Christmas break. We have, it's been a busy one where we've caught up with almost all our family, hosted Christmas and Boxing Day lunches at home as well as visits to catch up and chill out too. 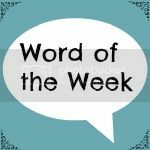 I didn't post a word of the week last week but if I had I'm pretty sure it would have been full - full of festivities, family, fun and food! It's that time of year when weeks merge into each other and this word of the week is a strange one too, because it feels like Monday. Except it's still Friday - yippee! It's also the time of year for reflecting on the year just gone and looking forward to what's to come, whether that's by setting goals, resolutions or by choosing a word. I'm no different and I've been musing on what 2015 will bring, and more importantly what I can do to make the things I want to happen happen! I'm not quite there yet, and still have a bit more thinking to do - perhaps something more structured and less dreamy may help! Who knows. I'm refusing to beat myself up about this as I'm pretty sure I'll come up with a plan that feels right. I already know some of the big stuff and some of the smaller stuff too but not all of it - who does - and I'm certain I'll get there, or mostly thereabouts. I'm sure there'll be blog posts looking back and forwards too once the musing has stopped or at least has reached a natural pause, but first who wants a cup of tea?